426 pages, 11 illus., bibliog. Charles Adams is Professor of English and Dean of the Honors College at the University of South Florida. He specializes in Early American Literature with interests in Native American, African American, and world literatures. In addition to numerous essays and reviews, he has published two books: The Guardian of the Law: Authority and Identity in James Fenimore Cooper (1990) and a critical edition of The Narrative of Robert Adams: A Barbary Captive (2005). Christoph Irmscher is Provost Professor of English at Indiana University and the George F. Getz Jr. Professor in Indiana University’s Wells Scholars Program, which he also directs. His many publications include Longfellow Redux (2006), Louis Agassiz: Creator of American Science (2013), and Max Eastman: A Life (2017). 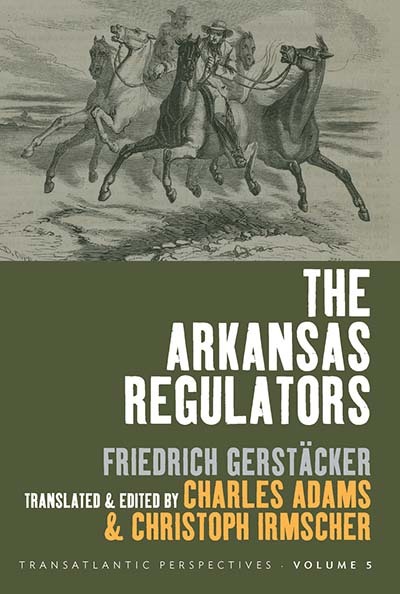 Related Link: For additional documents, images, and commentary related to The Arkansas Regulators, please visit Christoph Irmscher’s blog.